Mountain slopes and a natural bay is what makes Marmaris special. It’s a resort town on Mediterranean coast but it’s probably the most Europe-influenced place in all of Turkey. 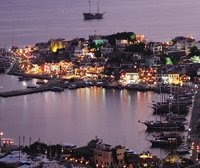 Many people come to Marmaris every year to enjoy their lifestyle, a great vacation and of course shopping! The Marmaris town is the best chosen base for sailing on the Mediterranean and because there are private yachts here, there is the modern marina to cater to them. The place is not all about water, they have an extreme kind of shopping experience here. Extreme because it’s not up for everybody’s liking. If you are patient, despite the touting from vendors, you could actually get good bargains. Don’t be ashamed to ask for a discounted price, if you want it cheap you got to play it hard here. If you want to buy ceramics, some leather, carpets or jewelry, the Marmaris market would be great for purchasing these at a cheap price. The Carsi Market has over 200 shops and they also have a flea market that’s open every day. Enjoy the Marmaris nightlife on Bar Street where there are several nightclubs and many bars that open until 4 in the morning. There are beachfront clubs too such as the Vagabundo where you’ll be delighted to see their staffs dancing on their counters. Marmaris have local and international dishes served on their restaurants. You’ll find different delicacies that are cheap or are quite expensive. It depends on your choice, you’ll find a lot of choices at their restaurants.